This weekend marks the start of the Fall season! Who doesn’t love making the most out of fall? Even in the city that never sleeps, the leaves die and the trees fall dormant making for incredibly beautiful scenery and cool breezes all of which encourage people to break out their fall attire and bask in the long-awaited cool weather. While cozying up with a hot cup of tea and a good book are certainly tier one fall activities, your flannels and boots will look much better out on the streets and at some of New York City’s best fall events. There’s plenty to choose from for a variety of ages and interests, but these top five are absolute must-sees in NYC. Looking for something spooky in honor of Halloween? Look no further than Blood Manor - New York City’s scariest haunted house experience. The house includes 5,000 square feet of terrifyingly themed rooms and passageways with everything from zombies to clowns to werewolves and more. It is described as the most “intense, creepy and ‘scream inducing’ haunted house attraction” in the New York tri-state area. General admission tickets are priced at $40 at the door or $38.50 online. Blood Manor is open from October 1 to November 3. The haunted house is not recommended for children or anyone with a heart condition, but anyone else is guaranteed to have a terrifyingly good time. Oh, and don’t forget to wear something you don’t mind getting blood on. The New York City Food and Wine Festival is the largest food and wine festival in the region. It will take place this year from October 12 through October 15. This event is a collaboration between the Food Network, the Cooking Channel and Food & Wine Magazine aimed at bringing attendees some of the tastiest cuisine in the country. Guests are invited to enjoy demos by nationally-acclaimed celebrity chefs, multi-course dinners at popular local restaurants, tastings and opportunities to see Food Network stars in action. This year is the event’s 10th anniversary - making it an event you won’t want to miss. Tickets are on sale now and priced per event at varying costs (some up in the mid-hundreds). Packages are also available for purchase which include multiple events throughout the course of the weekend. While the last two events are primarily catered toward adults, Giant Pumpkin Weekend at new York Botanical Garden is something the whole family can enjoy. This event showcases some of the nation’s largest pumpkins - some weighing in at over a ton - with last year’s largest pumpkin weighing in at 2,363 pounds! Participants in this event will have an opportunity to meet the growers and participate in a growing process Q&A. The giant pumpkins will be on display October 20 and October 21 from 10 a.m. to 6 p.m. 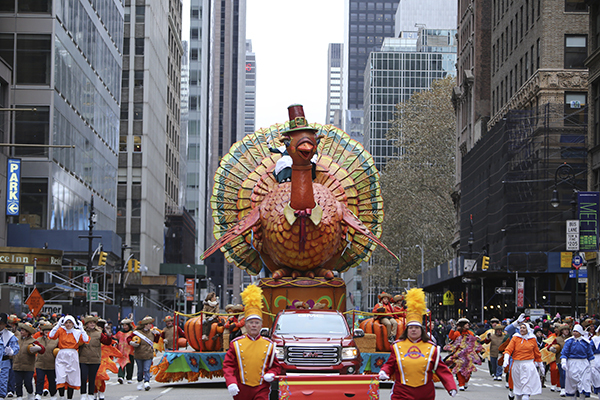 The Macy’s Thanksgiving Day Parade is so much more than a fall activity to cross off your list. It’s the world’s largest parade, an American icon and for many families, a holiday tradition. If you’re available to attend on Thanksgiving morning, that will be one more thing you can cross off your bucket list. For those who may not know, the Macy’s Day Parade has been a part of the city since 1924 and each year attracts around 3.5 million people. Over 2,000 performers flood the streets including dancers, clowns and marching bands and each year the parade features 30 large floats. Be sure to verify the parade route before arrival and plan to arrive early to do your best to beat the crowds. You’ll thank yourself later when you remember to dress in layers. Sure, the Macy’s Thanksgiving Day Parade is known around the country and is basically a New York City staple...but nothing beats dogs dressed in Halloween costumes. That’s why the Tompkins Square Halloween Dog Parade is number one on our list. If you’re a dog lover, you won’t want to miss this event. If you’re not a dog lover you can see yourself out. This is the place for all of the city’s best dressed pups to come together to show off and compete for thousands of dollars in prizes. This event is free and open to the public. The runway competition begins promptly at noon so don’t be late! What says fall more than getting out of the city and into a beautiful orchard for some fall festivities? The Hamptons are equally as beautiful during the fall season as they are during the summer season. If you are looking to get outside in the crisp air with latte in hand for apple picking, check out Seven Ponds Orchard and Hank’s Pumpkintown. Seven Ponds Orchard, located in Water Mill, offers apple picking with multiple varities including McIntosh, Honeycrisp (our favorite), Fuji, and more. They are open every of the week until Thanksgiving, and also offer hayrides and a corn maze for the kids. Hank’s Pumpkintown is well known on the East End and a family favorite each season. Also located in Water Mill, it is a great place for the family to enjoy apple and pumpkin picking. They also offer a variety of fall favorites for sale including mums, straw bales, Indian corn, and baked goods. Regardless of how you participate, there are some fall activities for everyone in the family that are absolutely timeless, especially in the big apple. Between haunted houses, giant pumpkins, wine tastings and dogs in costumes - you’ll find that fall in New York is simply a continuation of the hustle and bustle that the city is known for.